wondered what would happen if a cowboy and mermaid met - this story is for you. This is a story about a boy and a maiden. The cowboy called Austin could hear the thundering hoofs of the red skins’ horses approaching. He cursed under his breath (not the vulgar kind but the “Rattlesnakes” or “Bullspit” kind, for his Mamma raised him a decent cowboy). The Indians were drawing near with the promise of a classic-arrow-through-the-heart death and a grisly-deeper-than-skin haircut. Austin’s scalp prickled at the thought and he spurred his mare, Old Sal, on even faster. By now, they had gained a considerable (but given the terrain of the West, rather useless) advantage. With a jubilant cry Austin remembered a gorge nearby. It was hidden from view and only someone who had been there before would recognise the entrance. He signalled Old Sal and they started veering to the left, toward the canyons and coulees. Austin had accidentally stumbled upon it one day when Old Sal threw him and headed for the hills. Austin had watched his mare gallop away, feeling rather dejected, and then flustered as his horse suddenly disappeared. When he finally tracked her down, she was basking waist-deep in an audacious fountain (for really, what right did the fountain have for gushing forth in the middle of the desert?). That day he had made a mental note of the pool’s location and carefully covered their tracks. He had trusted the concealed oasis would come in handy someday. He would not be disappointed. When Austin recognized the entrance, he hastily dismounted Old Sal and started leading her through the winding channels in the hillside that ultimately lead to the pool. After a short distance, Austin dropped the mare’s reins on the ground and headed back. A few sweeps of a shrub later, their tracks were erased. The wind held its breath – curious as to whether they would make it. They took a left turn, curved to the right, but still the pool would not appear. Doubt was just starting to whisper cruel thoughts into Austin’s ear when they rounded the final bend and saw the glistening water. Austin smiled gratefully. Doubt sighed disappointedly. The pool was even more beautiful than he remembered. It was situated at the bottom of a sheer cliff face and enclosed within the surrounding overhangs. There was only one way in and out. Perfect for a defensive position. Old Sal was tied to the only tree in the clearing, a gnarled old thing that reminded Austin of his great granddaddy, and he headed for the water. A nervous whinny from the mare alerted Austin to the sounds in the distance approaching. He froze and strained his ears. Muffled (or was it baffled?) battle cries and orders reached him across the wind. With a bit of luck, they’d give up and head out again. Turns out Lady Luck had a thing for blue-eyed cowboys, because sure enough, after a few nerve wrecking moments the noises receded until finally… everything was quiet once more. “We really dodged a bullet there, hey girl?” Austin whispered in Old Sal’s ear and headed for the pool’s edge. Because Austin was submerged in thoughts about tobacco and bar brawls, he didn’t immediately notice the rippling in the pool’s surface. In fact, it was only when his boot’s tip touched the water that he finally saw the person emerging from the water where they had no doubt been waiting patiently to ambush him unawares. Now, Austin was no stranger to the West, and this would not be the first (or last) surprise attack he’d ever encounter. In a blink he’d drawn his gun and fired. By the dull-sounding “thud” that followed, Austin assumed he’d been successful (not exactly an impressive feat, considering his target was merely two metres away). He nearly dropped his weapon in shock. The person (after a brief observation clearly discernible as a woman) thrashed in the water melodramatically while a string of obscenities flowed forth from her lips. Dumbfounded, Austin realised that it, well she, had a tail. Austin shamelessly gawked at the peculiar creature. Somewhere deep (really deep) within his childhood memories, he recalled tales being told of weird and wonderful creatures such as this one. A water nymph, that’s what he thought it was called. But if his memory did not fail him (frankly no one would blame him if it did – he was after all no elephant), water nymphs were small things. The being before him, though, was as large as a man. “What are you?” he finally squawked. It/she (you could never really be sure with mystical monsters, could you?) hissed at him and slapped it/her tail against the water, drenching Austin in water. “I am a mermaid,” she declared indignantly with an expression that implied he was really stupid for not knowing this already. A mermaid… the word brought pictures of deceptive beasts, luring men to their watery graves to mind. Involuntarily, Austin took a step back. Now, Austin was smart by Western standards – he could tie thirteen different knots, knew how to dodge bullets fairly well, stayed on a horse and could draw his gun in above-average time – but of worldly things he knew little. A baboon was not something Austin was acquainted with. Old Sal merely twitched her ears and continued scratching her neck against the tree bark. Remembering his mother’s chivalry lessons about women in peril, Austin immediately rushed to the mermaid’s side. What he intended to do once he got there, though, he had no idea. She squinted at him suspiciously. Austin, now waist-deep in the water next to the mermaid suddenly had second thoughts. What if this had been the creature’s plot all along? What if she had simply lured him in to feast on his innards? His dismal train of thought was abruptly derailed by the mermaid’s moaning. “Just help me over to that rock there,” she sighed theatrically. Mermaids’ love for drama was just one of the things Austin would soon come to learn about her. Fifteen minutes later, Austin bit off the last stitch’s thread and carefully placed the needle and string back in their wooden box. The mermaid, whose hair had dried in the meantime to reveal a bizarre combination of straw-blonde speckled with a greenish moss tinge, stared at the closed-up wound on her tail intently. “This will do,” was all she murmured. This was not all she had murmured when Austin first cut out the bullet and cleaned the wound with alcohol. Where exactly did she hear all these phrases anyway, imprisoned in a pool in the middle of the desert? She handed him his shirt back – now soaked in pink-red mermaid blood – and he started rinsing out the worst of it next to the rock where the mermaid was perched. The mermaid gingerly wriggled her tail, and her tail fin, submerged in the water, rubbed against Austin’s forearm. (You know what fish feel like? Now cover that fish in slime and add a few more barbs) His expression must have read “yuck” because she shrugged exasperatedly and moved her tail away. Austin peeped at the mermaid from under his hat while he washed. Besides the larger-than-life fishtail, she looked utterly human. If she had claws or fangs, she hadn’t shown them yet. He removed his hat and pulled the clammy shirt over his head. Wooden box in one hand, hat twiddling in the other, he slowly started backing out of the water. The mermaid glared at him for a few agonising moments, fixing him on the spot. “Oh fine, you can go now. Consider your debt paid,” she flippantly said at last. Austin turned and fled gratefully (to his credit, he left at a brisk walk and not a run). He hastily stuffed his saddlebags and untied Old Sal. A loud splash resonated from behind him. He swivelled around and saw the mermaid’s tail disappear below the water. A strange despondency came over him then, seeing the creature vanish like that – as if it had all been a dream. He knew the fellows back home would certainly think his story the result of dehydration and mirages. He mounted his mare, meaning to leave, but Old Sal obstinately headed for the water’s edge to drink. There, astride his horse, Austin saw the mermaid’s head break the water’s surface in the middle of the pool. “Name?” she enquired, water droplets glistening on her cheeks. “Old Sal,” Austin replied and patted the mare’s neck. “Your mother called you Old Sal?” the mermaid asked incredulously and laughed. She bobbed up and down in the water. “Austin,” Austin replied with a tip of his hat. Old Sal finally stopped drinking and started turning around. The mermaid ducked her head underwater. “And yours?” Austin yelled, suddenly overcome with an inexplicable desire to know hers. “Till we meet again, Merileah?” A hopeful question rather than a statement. She looked at him sideways for a long time and then answered, “I’ll reckon so,” before vanishing into the dark waters below. The cowboy and the mermaid saw each other again four times after that first encounter. Each time the cowboy passed that canyon, he managed to conjure up some reason as to why it was crucial for him to visit the pool. The truth be told, he was curious about the mermaid. Who wouldn’t be? The first time he wanted to check whether it hadn’t all been a dream. The second time he convinced himself the specks in the distance were bandits and he needed to seek shelter in the canyon. The third time he blamed Old Sal’s thirst. The fourth time…he ran out of excuses. Austin finished his last bit of rabbit and threw the bone on the nearby pile. He got up and started digging a hole to bury the remains – lest the scent attract scavengers. Ribbons of golden light lit Austin’s hasty camp. The light crawled slowly over a bedroll, horse tack, a few smouldering coals, Old Sal’s rump and over the mermaid’s back as she lay basking in the sun on her rock. Soon the setting sun would be cut off by the steep cliffs surrounding the mermaid’s clearing. Austin wiped his hands on his shirt (once beige, but now after weeks of relentless trekking, a swampy brown). Seeing this, he thought it might be a good idea to wash up a bit. He proceeded slowly to the water. Being a cowboy, of course, he had an irrational fear of losing his “grimy outer layer of protection”. Even so, he figured a wash was long overdue. At the water’s edge he removed his worn leather boots and his socks. And then, Austin did a very brave thing. He walked into the water until it reached the top button of his shirt (which of course he was still wearing for cowboys saw water so seldom, any encounter was washing, bathing and swimming in one). He flailed his arms a bit, a swirl of six weeks’ dirt dissolving in a hazy cloud in the water around him. At least I’ve never seen any, he thought uncertainly. With a mermaid, you never knew. He admired her glistening wet skin now as she swam towards him. “You’re polluting my pool again,” she noticed drily. He shrugged and drifted back a bit. Even after years of friendship and not-getting-eaten, it was difficult to snuff primal instinct. (Instinct that was tugging at his stomach and sending him unhelpful images of eels and alligators whenever the water churned around her swimming form.) She dove suddenly and startling Austin, reappeared an arm’s length away from him. (Those primal instincts mentioned before, kept him statue-still. Don’t move – and the eagle won’t spot you, thought the hare…) Merileah reached out and caught his billowing shirt between her fingers. (Nail less, in case you were wondering. Just one of the many marvels of mermaids – like the fact that they didn’t have belly buttons or the ability to vomit). Austin recalled the conversation they had concerning clothes during their second encounter when he had given up trying to explain cotton plantations and exasperated, stated, “It’s my second-skin, alright?” Which she had accepted unquestioning. “You should take better care of your second-skin,” she chided now and released his shirt to stroke his bare collarbone underneath. (Easy rabbit - don’t bolt.) Her hands had the same slimy quality as her tail – not unpleasant, just slick. Merileah moved her focus to his face now and scrutinized every line as Austin remembered his grandmother doing a long time ago to check for stray grime before church. Just when her proximity was about to prove too much for his rabbit-heart, she drifted away again, mumbling that he ought to spend more time in water by the looks of his wrinkled skin. By now the sun was fast disappearing. Austin finished washing and dripping wet strode from the pool to Old Sal’s side. The old girl was getting a bit grey around the muzzle these days. She nibbled his shoulder affectionately. He stoked the fire anew, undressed (behind Old Sal), reassured a distressed Merileah that it didn’t hurt to remove your second-skin and sat huddled in his blanket across the fire while his clothes drip-dried on the old granddaddy tree. Through the flames he saw the red blaze reflected in Merileah’s eyes at the water’s edge. Austin took out his harmonica and played every song he knew that night, gazing occasionally at the stars… or at the mermaid floating in the water, eyes closed, a contented smile on her moss-tinged lips. With each visit, the years’ changes became more apparent in Austin while Merileah remained surreally similar. Old Sal’s clip-clopping grew slower. The cowboy’s hair became greyer. Quite some time passed before the cowboy and mermaid laid eyes on each other again. Austin patted Old Sal’s neck and whispered soft encouragements in her ear. They were nearing Merileah’s pool, after a long and arduous journey. The sun baked down on them mercilessly and Austin actually considered polluting Merileah’s water with a swim once they got there. They rounded the final bend. The words died on his lips. He blinked again to be sure, but it was no mirage. The pool had been reduced to a diminutive puddle in the middle of a circular patch of cracked mud. All that was needed to complete the dismal picture, was a skull… or fillet. Austin’s eyes roamed the clearing frantically as he jumped off Old Sal. Where was she? The mud contained the rotting remnants of water plants and various rocks previously hidden under the water. Among these he found the rock Merileah had been sitting on while he’d dressed her wound. Back then, she had sat on it under water, but now, with the water gone, Austin could see it was really a boulder. It was here, in the shade behind the boulder that Austin finally found Merileah. Her upper body was covered in red blisters, her scales glaringly bright in the unforgiving sun. Austin carefully pushed back her hair obscuring her face like a veil. Surely magical creatures were made of sterner stuff than humans… surely she couldn’t be gone? Her eyes remained closed, her body utterly still. Merileah! Austin swivelled around and there she was, gazing up at him. Her eyes were bloodshot, but her feeble smile was heartening. Austin quickly fetched his water canteen and poured the precious liquid into Merileah’s parched mouth. “Ah…” She seemed to visibly recuperate already. Her eyes became clear and alert again. Suddenly worry replaced the relief on her face. “I can’t stay here,” she murmured. “Don’t fret. I’ll get you to a safe place,” Austin reassured her determinedly. Within ten minutes, Austin had prepared everything for their journey. 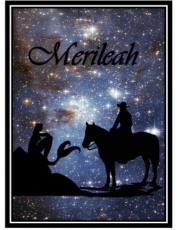 He soaked his blanket in the meagre, remaining puddle and wrapped it tightly around Merileah. “My own second-skin,” she smiled weakly as he cautiously folded it around her dry and brittle tail. Old Sal’s saddlebags were readjusted to make room for Merileah in front of Austin. After some considerable struggling (it was no easy feat lifting a man-sized fish onto a horse – even if it did have arms to help haul) they were ready to depart. The reassuring pattern of Old Sal’s hooves quickly lulled Merileah to sleep. When she finally awoke with a jolt, the stars were already twinkling happily. The mermaid glanced back at the cowboy and involuntarily smiled. Austin’s hat was drawn low over his eyes and gentle snoring resonated from beneath it. Merileah slapped her wrapped tail against his leg. Austin woke with a jump and grunted groggily. “Of course not!” Austin retorted indignantly, “Old Sal knows the way. She just follows that North Star all the way home. We were never astray.” Austin patted his mare caringly. Merileah’s unconvinced puckered brow spoke volumes. The conversation soon turned serious again, “My home…The rains just stopped coming a few seasons back. I got so scared at the end…” Her voice faltered. “You can live with me,” Austin declared decisively. “You never mentioned you lived in a pool too,” the mermaid smirked, dismissing the notion for a joke. The mermaid returned his stare for a long while. The cowboy and the mermaid lived quite contentedly on their little farm – for indeed, the cowboy was true to his word and he had bought a patch of land with a natural fountain and built a suspiciously spacious dam in one corner. The mermaid initially recovered in his bath tub while the dam was under construction. It didn’t matter. The cowboy didn’t exactly use the thing anyhow. The cowboy and mermaid spent the rest of their days talking when he wasn’t out in the field herding and their nights gazing at the stars while he would play his harmonica. The cowboy brought the mermaid some fish companions. Old Sal finally retired and took up ploughing as a hobby. The cowboy grew ever greyer. The mermaid still remained the same. Until in due course, the cowboy laid eyes on the mermaid for the very last time. Some believe, the mermaid is still there, living in her fountain on that patch of West. © Copyright 2019 Alex Sanders. All rights reserved. This page was created in 0.4544 seconds.